You can do this pretty easily without acid and get pretty good results. I’m in New Zealand… The nice caring authorities here don’t trust people like me with sulphuric acid needed for the usual methods. It’s not that easy to buy here. Never mind.. there are alternatives. Sodium Bisulphate – commonly used to lower the PH of swimming pools. This is a salt of Sulphuric acid and for my purpose, will work fine. Usual disclaimers here… I’m not responsible for any damage you do to yourself etc if you attempt this. Use common sense when using these chemicals. This works for me. First I make sure the aluminium is really clean and all those machining marks have been taken out. And when you think it’s really clean, clean it again. 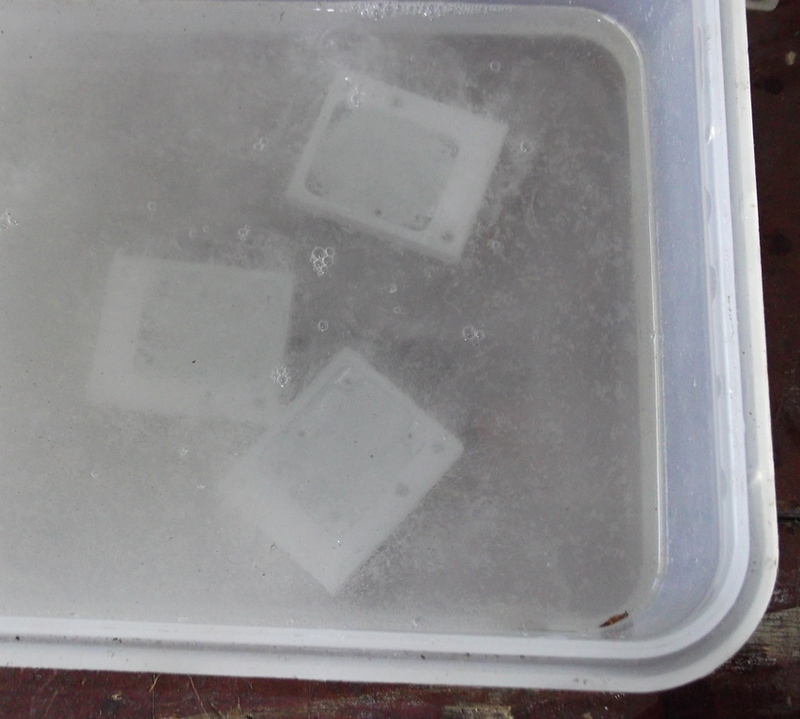 I like to etch the aluminium in some Sodium hydroxide (NAOH, Drain cleaner) for a few minutes. A few teaspoons in a 1/2 litre of water is all you really need. Sodium Hydroxide is nasty stuff on skin and eyes….cover them. I don’t soak it longer than about 5 minutes. This eats aluminium nicely. I wash in water taking care not to touch with my oily hands…. So I have my newly anodised case. Time to dye it. I’ve experimented with a number of dyes/inks. I’ve had varying degrees of success with black acrylic dyes and inks. Most of these give a blue or purple colour on aluminium. So black acrylic ink gives me any colour between purple and black depending on concentration. A bit of experimmentation is required here. For this, I’m using some ‘Pebeo colorex’ black ink. I now use the ink non diluted. I apply it with a small brush. 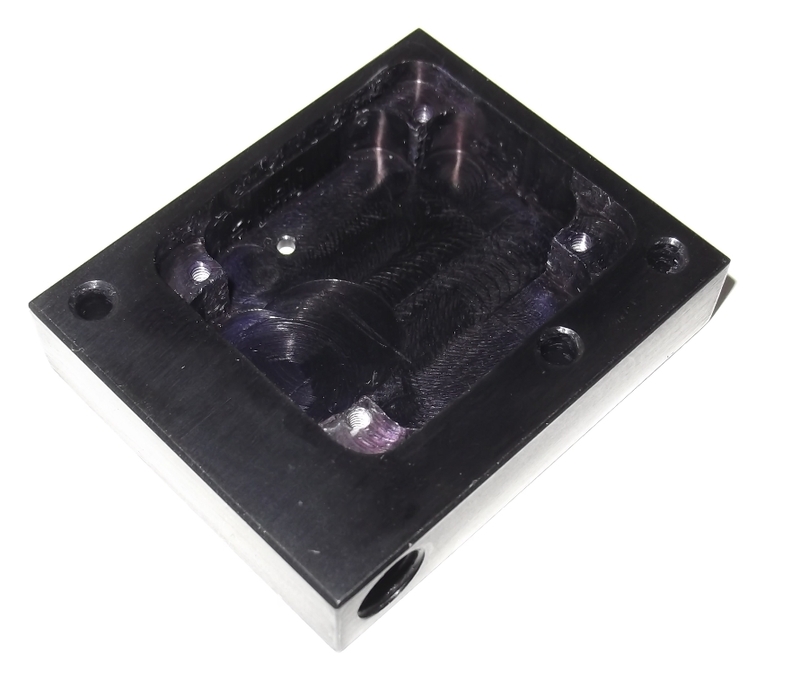 Providing your anodizing process has worked properly, this should soak up the ink almost instantly. If you can still see the metal after applying the ink, the aluminium is either not clean enough or hasn’t been anodized long enough. I then boil it for about 20 minutes in boiling water to seal. 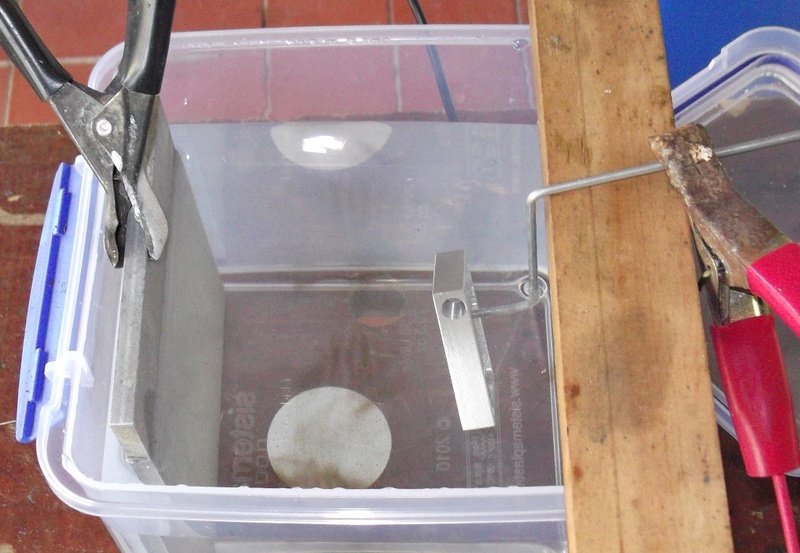 You can remove the anodised coating if necessary by soaking it in Sodium Hydroxide again. ← Encoder boards and casings.